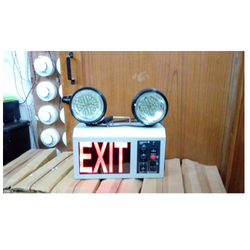 An portable attractive halogen twin multi light with LED exit rechargeable unit, suitable for long corridors with exit doors. 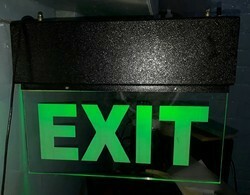 The Exit Light Signage offered by us in the market is manufactured using raw materials of the highest grade. 1. The housing is adopt with high precision moldings.2. White Housing : Fire retardant ABS3. Backed ourselves with sound amenities and talented personnel, we have emerged as one of the leading firms of superior quality Exit Signage(AC/DC). Offered exit signage board provides maximum illumination although consuming less power.